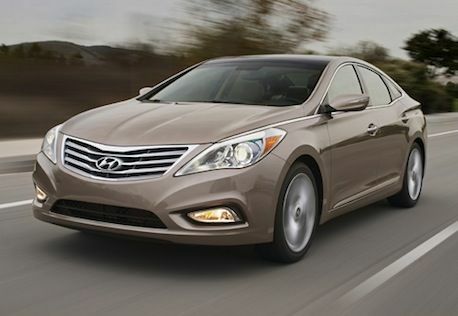 Pricing announced for all-new 2012 Hyundai Azera, but is it worth it? Do all-new features and a complete redesign justify a $6,000 price hike in the 2012 Azera? Hyundai Motor America just announced the pricing for the redesigned 2012 Hyundai Azera and it’s roughly $6,000 more than last year’s model. The all-new Azera will start at $32,875 for a well-equipped base model and go up to $36,000 for the top-of-the-line Azera with Technology package. All models will also include an $875 destination charge when the sedan goes on sale this April. • SACHS Amplitude Selective Dampers (ASD) for improved ride comfort without compromising handling. In addition to the new standard features, prospective Azera buyers can also opt for the Technology Package, which costs $4,000. The all-new tech features include a panoramic sunroof, HID Xenon headlights, Integrated Memory System (IMS), Infinity premium speakers, power rear sunshade, rear parking assistance sensors, ventilated front seats and 19-inch alloy wheels and tires. In general, Hyundai is taking a more youthful approach with sleek and bold designs, aiming to give the car an “illusion of constant motion,” according to Hyundai’s press release. Hyundai is also looking to add a modernized approach to performance and fuel economy. The 2012 Azera contains a Lambda II 3.3-liter Gasoline Direct Injection (GDI) engine and a 6-speed automatic transmission with SHIFTRONIC®. As for fuel economy, the upcoming Azera delivers a best-in-class 20 mpg city, 29 mpg highway and 23 mpg combined. Aside from solid mpg numbers, the Azera also contains an Active Eco system, which adjusts transmission and engine controls for an added boost in fuel economy. As is standard with all Hyundai vehicles sold in America, the Azera includes a 5-year/60,000-mile fully transferable new vehicle warranty, Hyundai's 10-year/100,000-miles powertrain warranty, and five years of free Roadside Assistance. Hyundai hopes that the newly redesigned Azera will help the automaker compete with large-sedan heavyweights like Toyota Avalon, Ford Taurus, Buick LaCrosse and Nissan Maxima. Price-wise, the base model Azera is more expensive than the Taurus ($25,555), Maxima ($32,060) and LaCrosse ($30,170), but cheaper than the Avalon, which starts at $33,195. Dave Zuchowski, executive vice president of sales for Hyundai Motor America, told Automotive News last year that Hyundai expects Azera sales to reach 15,000 in 2012. Though ambitious, Zuchowski’s goal appears slightly lofty since the 2011 Azera only sold 1,524, which was less than half of what is sold the previous year. Will added features and a complete redesign translate into bigger sales figures for the 2012 Azera? Hyundai will soon find out when the all-new Azera is released in April. For more information click HERE to read the full press release. Anthony, How could you forget to include the 2 most important standard features on your list: LEATHER NAVIGATION I believe only the Avalon has leather standard. And NOBODY except Hyundai has navigation standard. The fact that these 2 are standard features (including heated seats and a few others you mentioned above) is remarkable. Forgetting to mention these 2 features as standard is a glaring omission indeed! the question of "is it worth it..." is really a non-issue....aside from the Azera name...there is NOTHING in common between this generation and the last. They are 2 different cars, representating 2 different eras of Hyundai.